Coming to Monmouth & London in July 2012…. 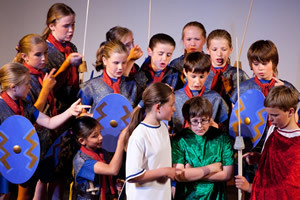 We are very excited to inform you that ‘Minimus the Musical’ will be performed again in July 2012, in a joint production by the Year 7 girls and boys from Haberdashers’ Monmouth School for Girls and Monmouth School. The musical will be performed in both Monmouth and London by the same cast, so we are one step closer to bringing Minimus to the West End! Performances will take place on: Wednesday 4th July: Monmouth, 1.30pm & 7.00pm Friday 6th July and James Allen’s Girls’ School, Dulwich, London. 1.30pm & 6.30pm. Please put these dates in your diary and we look forward to welcoming you to the show! Lots of press coverage about Minimus in North Norfolk! Click here and here to read the reports. Following an enjoyable and very successful two days in Belfast last November, I was very pleased to be invited back by Isabel Bredin of Belfast High School and to visit another four primary schools in the area. Thanks to excellent transport provided by Isabel’s colleague Julian King, Nick and I were able to work with two classes in each of the four schools giving Minimus taster lessons. So this makes a total of ten primary schools in the area that I have visited this year. The children enjoyed having Roman names, learning to read Latin, to understand it, doing a lot of work on word derivations, acting, singing Happy Birthday in Latin and discussing the Vindolanda tablets, in particular the difficulties in decoding the famous birthday invitation . Julian hopes to offer follow up lessons to all these schools in the Spring Term next year. It is excellent to have Isabel and Julian’s support and for Belfast to be something of a beacon area in promoting Minimus. Great things are happening in Norfolk with regard to Latin! Jane Maguire, a member of the PLP Committee has been responsible for Gifted & Talented children in 30 primary schools in the Norfolk area. She has introduced Minimus in 16 of these already and has trained and supported mentors who are not necessarily Latin specialists themselves but who are doing a great job. Jane also works closely with Colly Mudie from the Norwich Castle Museum and they have collaborated in organising a number of special events. 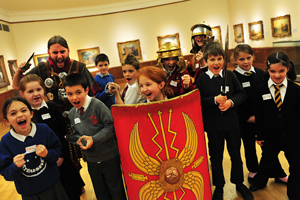 In March it was a great privilege to be asked to join a Latin day at the Castle Museum which they had arranged. Local school children who are already using Minimus were invited. The children had the chance to explore the excellent Roman galleries. They met a Roman soldier who helped them to understand what it actually felt like to be a Legionary soldier. He got us all marching around the museum which caused some interest when we marched through the Museum Café! 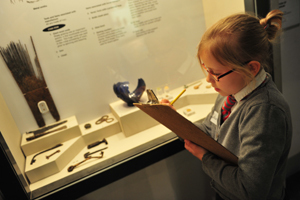 In another session they had the chance to handle Roman artefacts and discuss their possible uses. This session was also led by a ‘Roman’. In the plenary sessions, Jane had us all singing a crazy song about the Romans and finally they asked me questions about the writing of Minimus and the family at Vindolanda. The day was attended by 42 children plus their teachers. In June Colly and Jane organised a Minimus taster day for local schools. When I left in March eighty children had already signed up for this. Unfortunately I was not able to attend but I gather it went very well and I hope to attend such days in the future. The March day attracted the attention of local radio and in the lunch hour, reporter interviewed Jane, Colly and me as well as two of the children who made it clear that they were having great fun and enjoying themselves. On the following day, Jane invited me to visit some of the schools in Great Yarmouth where she has introduced Minimus. The first stop was Alderman Swindell Infant School where children from several primary schools gathered and the event began with a group of 5 year olds standing in a line greeting me – ‘Salve Barbara!’ –and then they gave their Latin name, Marcus sum, Camilla sum etc. I found it moving to hear such tiny children, who after all have only been on the planet for five years, greeting me in Latin. Also at this event were children from Great Yarmouth High School who had begun their Latin with Jane at Alderman Swindell Infant School and came back (now in Year 8) to see how things were going with Minimus. They spoke very positively about their experience in learning Latin and said that because they had enjoyed Latin so much, they had each opted to do a modern foreign language at GCSE. There are plans to introduce Latin at the High School and this would be an excellent development. Later in the day I visited two other schools and met children from four schools who are all using Minimus. I also enjoyed meeting their mentors who are young teachers with an interest in widening their experience so have volunteered to teach Minimus. These lessons are all taught on the timetable to Gifted & Talented children. I enjoyed watching plays, hearing Latin singing and generally chatting to the children, especially about Vindolanda and the importance of checking the evidence when learning about the ancient world. I was also delighted to meet the Head teachers from each school. It was generous of them to find time to see me at the busy end of term. Great Yarmouth is an area of much social deprivation so it was especially encouraging to see Latin flourishing there. Twenty- eight children and nine staff set off from Bristol airport on November 24th. We took all of our costumes and props with us, including twelve shields, daggers, swords and javelins! The children had to perform the show three times, once on each of the three campuses, where eight schools make up the International School (a total of 4,000 pupils). The schedule was extremely hectic and there was no time for any rehearsal. The cast had to perform in three different venues that they had never seen before. This would be a challenge for a professional company; for a cast of ten year olds it was an astonishing achievement. 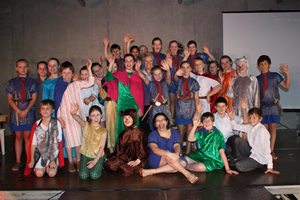 They did a great job and the show was watched by over 700 children. They seemed to thoroughly enjoy the show and were very positive in their comments afterwards. Meanwhile my cast had a wonderful experience in Geneva as they stayed with host families and many have made new friends whom they plan to re- visit. I am especially grateful to Dr Nick Tate, Director- General of the International School for inviting us in the first place and his wonderful administrative team who organised all the arrangements most efficiently. 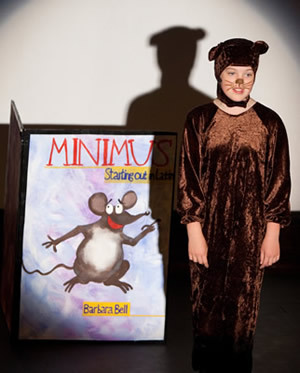 The children were delighted to have the opportunity to perform Minimus the Musical again. Click here for bigger images. I am very grateful to Isobel Bredin, Head of Classics at Belfast High School who organised a busy two- day programme promoting Minimus in mid –November. Nick and I visited six schools – five primary and one secondary: Fullerton House, Downey House, Inchmarlo, White House Primary School, Ben Madigan and Carrickfergus College. We were warmly welcomed in each school and I taught Minimus taster lessons and talked to the children about my reasons for writing Minimus, the family who lived at Vindolanda etc. We were glad to see a little of Belfast and grateful to Julian King for ferrying us around for two days. It was good to meet the children as ever but also to talk to teachers and Head Teachers about Minimus and what it can add to a school curriculum. 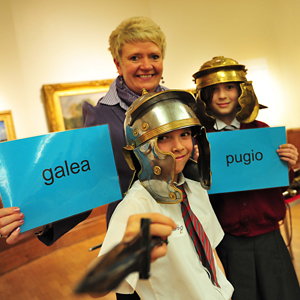 It is excellent to have Belfast High School as a centre that promotes Latin for young children in Northern Ireland. We hope to set up a return visit in the Spring. When my pupils at Clifton High School received a standing ovation on the last night of the show and I looked at the expressions of exhilaration, pleasure and triumph on their faces, I knew that the preceding nine months of hard work had all been worth it. Turning my books in to a musical was a long-standing dream of mine and thanks to the genius of Christopher Northam (Musical Director) and the skill and expertise of Kelly Packer (Choreographer) my dream was fulfilled. We had four performances and played to virtually packed houses. Thanks to the generosity of many Minimus supporters, we were able to afford to have the costumes professionally made and we had a proper colour souvenir programme. A DVD of the show was again professionally filmed and this is available if you were not able to get to the show. You will need to buy this through ‘Minimus et Cetera’; an order form is on this website. What I enjoyed most was seeing the children gaining confidence throughout the summer term as we rehearsed intensively. The show is based on all the members of the family at Vindolanda (including the animals) with a chorus of Batavian soldiers. In the first half of the show we are introduced to the characters and in the second half they go off and do things and again this is based on the stories in the book, so the birthday party and the governor of Britain coming to dinner etc. One school which visited from Cheltenham was particularly pleased to hear of the Vindolanda tablet which mentioned socks and underpants as they had just done that story in school that morning! I am hoping that it may be possible to take the show to London. Boris Johnson has given his support of this idea and I am currently trying to find a space when it may be performed next spring or summer. Full details will be in the next newsletter, but I will also put any news of future performances on the website. The most exciting spin-off from the show is that we have been invited to perform it at the International School in Geneva. Most of the original cast will be travelling with me and a team of adult helpers to Geneva on November 24 th. We will perform the show on the three different campuses at the International School and we shall return – no doubt rather tired! – on November 26 th. This is a wonderful opportunity and the children are enormously excited. I am grateful to Dr Nick Tate, the Director of the International School for his invitation. To see more photos, look at this page. I am pleased to announce that the première of ‘Minimus the Musical’ will be taking place at Clifton High School on Thursday 1 st July 2010. For several months, I have been working to write the lyrics for the musical, which like the books is based on a real family who lived at Vindolanda. Many of the characters in the books make an appearance in the stage version! I have worked closely with Bristol composer Christopher Northam, who has turned the lyrics in to a series of imaginative songs, full of beauty and wit. There will be three performances to choose from; Thursday 1 st July; 1.30pm & 7.30pm and Friday 2 nd July at 7.30pm. Tickets are £8 per adult and £5 for children and concessions. If you live in the Bristol area and would like to come to see the musical, either on your own or to bring a school group, please contact Joanne Rosser at Clifton High School; jrosser@cliftonhigh.bristol.sch.uk Tel: 0117 973 0201 for a ticket application form. Boris Johnson, Mayor of London has invited me and four other Classicists to be part of a working group called ‘The Classics Round Table’ which is helping to promote the teaching of Latin in State Schools in London. The first event the group organised was hosted by Boris Johnson on 17 th March 2010. I spoke at a reception in City Hall, on how the Minimus books can be used to teach Latin in schools where it is not usually part of the curriculum. The event was attended by over 150 heads of both primary and secondary schools, all keen to see how Latin could be integrated back in to the school day, be it in lessons, lunch time clubs or after school clubs. I was honoured to receive my MBE from Her Majesty the Queen in an amazing ceremony at Windsor Castle. I was pleased to tell Her Majesty that Latin is now officially ‘cool’ and she said that was very good news and seemed genuinely pleased! I have sent her a copy of Minimus for her youngest grandchildren. In January I visited The Croft School in Stratford at the invitation of Lisa Chowne. I was delighted to meet the Y6 classes and to talk to them a little about Vindolanda, why I wrote Minimus and how the project has grown. They had some very interesting questions and we talked about the archaeological evidence for Vindolanda. I also had a tour of the school and met Y5 and was able to give them a preview of Latin lessons coming up next year. The children were enthusiastic about Minimus and have created some beautiful work. I have not been able to do much in the way of school visits this year as I have had an increased amount of teaching, but from September 2010, I hope to do more visits and would be happy to visit your school. If you are interested in this, please contact me soon to discuss the details. I enjoyed giving a Minimus Taster Lesson to eager participants at the Bath Literature Festival on 6th March 2010. All the students, both young and old enjoyed learning or recapping their Latin, ending the session with an entertaining cat and mouse chase! Barbara hopes to be attending the Bath Children’s Literature Festival which takes place between 24 th Sept and 3 rd October 2010. Please refer to www.bathkidslitfest.co.uk for further information nearer the time. We have recently held two successful training days, one in London and one in Bristol. Our thanks go to Jane Maguire, Shona Shahryar, Michelle Anderson and Gillian Hylson-Smith for speaking at the training days and imparting their knowledge of teaching Minimus, both in State and Independent Schools, either in lesson time or as lunchtime clubs. We were especially pleased to welcome two delegates from the USA to the training course in Bristol. They were pleased to see how Minimus was being used in different ways and have now implemented Minimus in to their school in Jackson, Mississippi. The training days are invaluable to you if you are teaching Minimus and want extra ideas or if you are embarking on teaching it for the first time. The courses are practical and interactive and you will come away with many ideas for teaching both the books. The next training course is taking place on Saturday 12 th June at James Allen’s Girls School in Dulwich, London. The cost for the day is £50 per person and includes a fantastic lunch! Please click here to download an application form. Or for further information, please email bmbellmini@aol.com and I will be happy to help you. Thanks to the generosity of Cambridge University Press, we spent four lovely days in New York. As well as meeting the CUP sales team in their marvellous offices overlooking the Hudson River, I also delivered a ‘webinar’ presentation. I spoke about the history of Minimus and why I believe it is important for young children to enjoy and benefit from Latin. My talk could be heard by teachers all over America; when I finished, they had the opportunity to ask me questions and both their questions and my answers could also be heard by everyone participating. I marvel at the technology! I am grateful to Jim Harmon of CUP for inviting us and setting up these events. We then moved to Baltimore. Ruth Ann Besse, a member of the PLP committee, had organised several Minimus events, including a training day and drop in session at the local community centre. This attracted more than 100 people, parents and their children. Finally we moved to Pittsburgh, where we spent four nights with another member of our Committee, Zee Ann Poerio. Again we enjoyed a series of different events; book signing, a tour of a local historic farm house followed by an English tea party and lunch, a presentation in the impressive Carnegie Museum and a Minimus event for children at Zee Ann Poerio’s school. 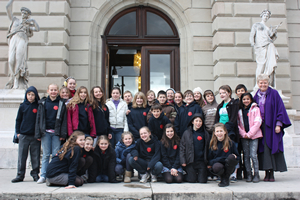 The children and teachers, aged six to fourteen, came for a taster lesson accompanied by their parents. After we had studied the birthday invitation, this lead neatly into the fact that Minimus would celebrate his 10 th birthday one month later. Zee Ann had organised a birthday cake, balloons etc and the children all enjoyed singing happy birthday to Minimus in Latin! Who would have thought when I had the original idea for the book that ten years later I would be enjoying a birthday party for the mouse in Pittsburgh?! We are so grateful to CUP, Ruth Ann and Zee Ann for setting up an unforgettable fortnight. It has lead to closer links with the USA teachers of Minimus.